Dr Peter Carberry (L) and Mr Rajendra Pawar exchange the signed MoU documents as Mr Sharad Pawar looks on. Photo: KVK-Baramati. A ‘live’ agriculture expo provided the perfect venue for an MoU signing to introduce new technologies for farmers in Maharashtra, in western India. 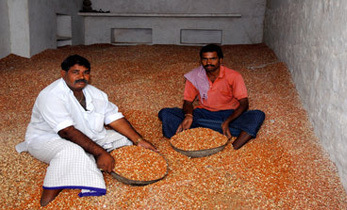 The technologies will help move towards doubling farmers’ incomes as part of India’s ‘Mission 2022’. The MoU was signed between Agricultural Development Trust (ADT)-Baramati and ICRISAT. 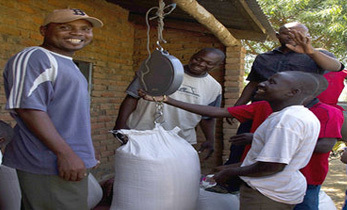 Farmers, national and state government officials and political leaders attended the event. The technologies in pigeonpea as well as intercropping of pigeonpea with sugarcane, hold promise for better incomes and nutritious crops. 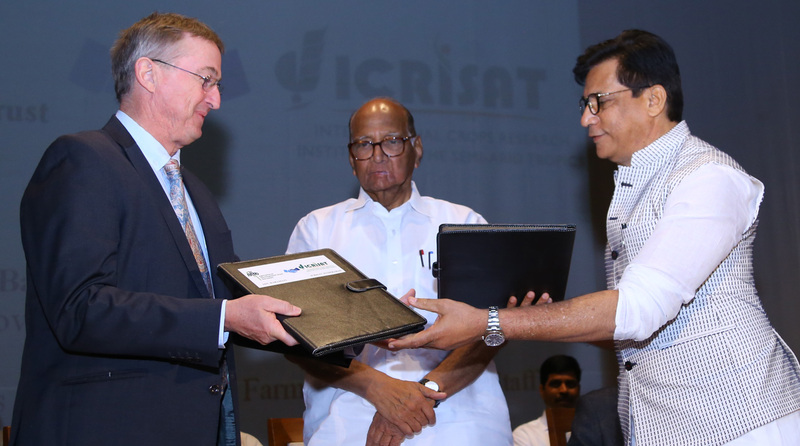 Mr Sharad Pawar, Member of Parliament, Rajya Sabha, (India’s Upper House) and President, ADT-Baramati, assured ICRISAT of ADT’s support in introducing innovations to farmers in India and appreciated the organization’s contribution to agriculture worldwide. 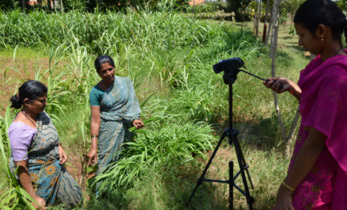 Dr Peter Carberry, Director General, ICRISAT, said that he was looking forward to this collaboration where new varieties and technologies introduced to farmers’ fields would benefit them. For her work in the region, Dr Anupama Hingane, Scientist – Pigeonpea Breeding, Crop Improvement Asia Program, ICRISAT, received special mention. 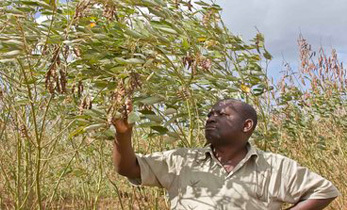 Developing technologies for intercropping of super-early pigeonpea with sugarcane. 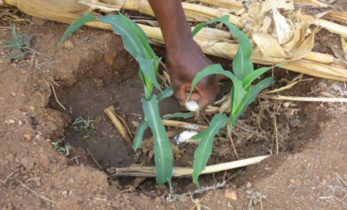 This research aims to find out if growing of pigeonpea (a leguminous crop) will reduce fertigation costs for sugarcane and provide farmers the additional benefit of growing a protein-rich crop like pigeonpea. Demonstrating hybrid pigeonpea technology to farmers. In view of ‘Mission 2022’ for doubling farmers’ income, ADT’s Krishi Vigyan Kendra organized the 4th edition of its annual exhibition “Krushik-2019” from 17-20 January. 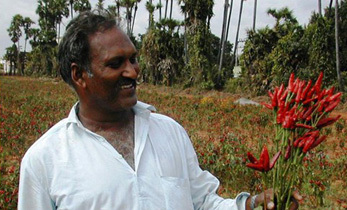 Field demonstrations of crops (cereals, pulses, vegetables, fodder, horticulture crops, flowers, etc. ), technology solutions, agricultural inputs, farm implements and machinery, irrigation demonstrations, and protected cultivation on 44 ha area were some of the attractions at the expo. Dr Carberry, who inaugurated the expo, said that farmers from Australia and Africa, who work in similar dryland conditions and face the same climate constraints, could benefit from visiting exhibitions like these. Dignitaries who attended the expo include Ms Supriya Sule, Member of Parliament; Mr Rajendra Pawar, Chairman, Agriculture Development Trust, Baramati; Mr Burzis Taraporevala, CFO and Company Secretary, Tata Trust; Mr UD Shirsalkar, Chief General Manager, National Bank For Agriculture & Rural Development ; Dr Lakhan Singh, Director, ICAR-Agricultural Technology Application Research Institute , Pune; senior officers from the Department of Agriculture, Mahatma Phule Krishi Vidyapeeth, Rahuri and trustees of ADT.